When we got our new couch, we were supposed to get rid of our ottoman. As you can see, we still haven't done that. It has become a resting place of passing hobbies and interests -- usually a mixture of Lego projects, entertainment and current events periodicals and of course ... my knitting. Well today, the ottoman empire (tee hee) belongs to me! Languish no more knitting projects, complete your journey to finished objects! Weaved in AND almost done blocking. 1st up we have a baby set. The infamous diaper pants in pink! (Andi is right, pink is an absolute pleasure to knit with, I'm going to find something pink to knit this summer!) And since I had some yarn left over, I tried a baby hat. I hope at least one of the two fit. 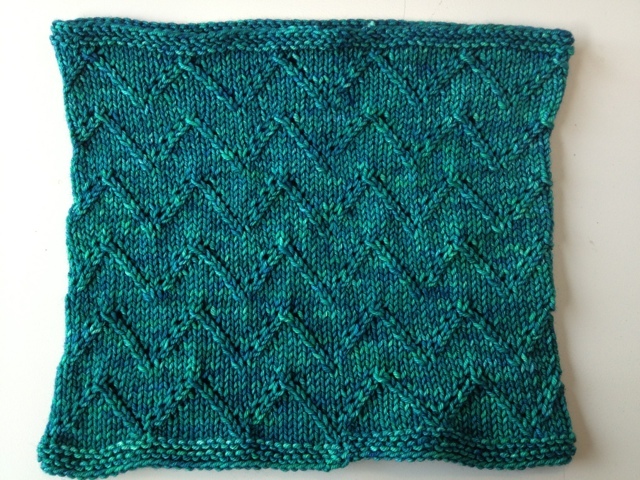 2nd is Saroyan which really was just a joy to knit. I hope it looks okay, but even if my mess-ups are visible, it will not stop me from knitting this again. My mother is visiting and thinks she needs to absorb this into her neck-ware collection. Before she heads back to Kansas I suppose we'll find out how much I love my mother, or how much my mother loves neck-ware, ha! 3rd is Yarnster. 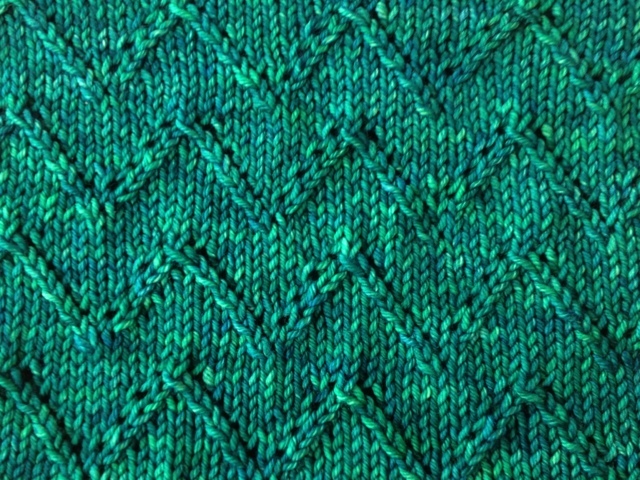 An easy knit that I somehow managed to modify anyhow. The yarn is tosh dk in Spectrum. This hat has confirmed my hat issues. All my hats seem to turn out a bit small. I need to work on that. But ... not right now. *I'll try to get some individual pictures later. So things have been kind of stomach knots and low grade headaches lately. This is my polite way of saying, I've been having a prom sized pity party for last week or so. I had a few days where I couldn't even lift the needles. I know. But then I realized, how is not doing the things I love going to make me a better person, or at least tolerable to be around. At least I kept up with my exercise. So after a few drafts of pity party posts, I am returning to knitting. Positive focus people. Make it happen. We hope people have heart, faith and principle, but if they don't, we're ready to bring our own. Or at least knit ourselves to some state of sanity and happiness. So I finished Lady A's Downton Cowl. This pattern seriously is a giver. I can't say I'm necessarily done making these. Lady A is so petite she can wear it like the fashionista, ballerina she is ... as a tube top! ha! I am just happy to hand her a homemade gift, wearable or not. 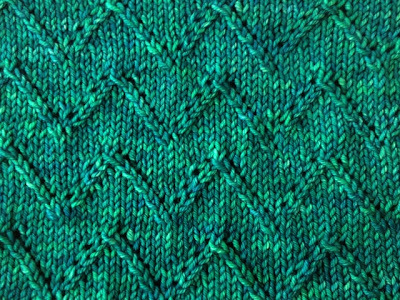 And did I mention, I really enjoy knitting these in Madelinetosh? heh. Last night, very late on my way to knitting for a better tomorrow I finished Saroyan. There were a few decreasing mistakes, but that's okay. I am hoping they are slight enough not to be noticeable. I guess we'll know, post weave-in and blocking. Stay tuned! Up next, I need some interim relief. I think I will try a hat and keep my Madelinetosh addiction properly enabled. I know many people are smarter than me. I get to benefit from listening to them, reading them, being loved by them, and just being around them. I think they've known this bit of information and tried to explain it to me multiple times. But as I am me, I am just figuring this out now. Would that mean my MOS is delusion? Quite possibly. Well, heck, it's good to be good at something, right? Let's go to the list shall we? Crack open my pain of a brain. Mitigating the risk:There is no way I can get all 8 things done. I have to let go. What is most important? The first half. Correspondence can be completed during work lunch, it might go out half a day later, but it still should arrive USPS by Sat. Then I will bake. I may have to bake before I shower. Disgusting, but doable. If for some reason, I lose hours, I will purchase ice cream cake from Bi-Rite on the way to the dinner party. Maybe I should be in bed at 11pm and then knit for 30 as a compromise? I still have 2 more days to see if I can identify camps I can send The Kid to with other families. Feasible with email confirmations during the day. But there you are. That is my adrenaline junkie. I have to commit to the exercise or I'm a nut job. I wouldn't get anything done otherwise, even with the time. I'd run around fretting. Not pretty. I have friends that are so much more organized than me that I'm blown away, I'm absolutely impressed with how compartmentalized, organized, and ... CLEAN they are. I'm beyond envy though (getting older is awesome in this respect) I just try to draw inspiration from other people's success and try to fit it in to my own kitchen sink ways. Here's to a sense of completion! 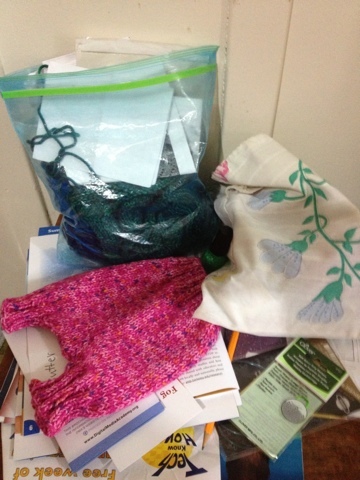 Okay let's start off with this is how my end table by my knitting chair looked this morning when I left for work. My poor husband is probably thinking he'll never have a tidy house between The Kid and myself. Now what was I up to? Finishing a pink baby hat to match those pink diaper pants you might be able to see under the pile of muck called, "my stuff". I baked cookies for a bake sale at the summer resource fair (trying to book summer camps). 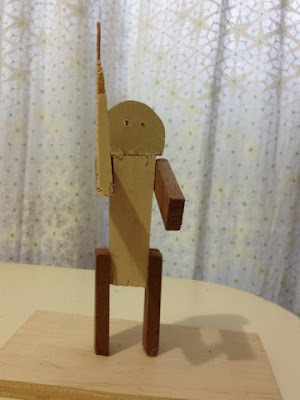 Took The Kid there with one of us his friends, met another friend at Mission Science Workshop again, where they terrified me with their use of the jigsaw. The Kid made this Burning Manesque wood sculpture. Of course it has a weapon ... of course. The three boys came back to the house to play and eat. (I had a small foreshadowing of the teenage eating years) and then they were shuttled off to play soccer for a few hours. I, in the meantime made my toes ... "magically delicious". I need some luck. I should probably buy a lotto ticket, and by the stink eye looks of some of the lady at the nail salon, maybe check my sanity for pretending I'm so into St. Patrick's Day. Stink Eye away, they sparkle and they make me laugh. A little fuzzy and green, ha! Sunday I woke missing that extra hour. I worked from home for a few hours while watching the FA Cup Manchester United and Chelsea match. Ahh, good stuff, and productive with the work stuff as well! We wanted to do a little household shopping (Target) and get a snack before visiting my father, so I felt like I was hustling just to get out of the door. I felt like I was running late until I got to my parents. I saw my sister and my lovely nephew, who is such a personality. I got the biggest, warmest welcome hug. He can be really stubborn, and I give him a hard time about it, but I know that pretty much everyone in our family has this trait, so I am secretly cracking up on the inside. He is still so young, nervous about learning to read with his speech issues. I try to be encouraging, I want him to be a confident (with reason) young man. I miss him just thinking about him. It was nice to see our two boys running outside in the sunshine. Which meant later that night when we watched a Manfriend movie (End of Watch with Jake Gyllenhall et al.) I could cast on for Saroyan. So much fun so far (which is not very far). End of Watch a mini review: I don't even know what I think of it. I was entertained, but I'm not sure if I should be. Was it a recruitment film for LAPD? It was Blair Witch Style quite a bit, first person shaky-cam. When there was a story line, and not a character study, it took a long time circling back there. A lot of scene dialogue felt like the McDonalds conversation in Pulp Fiction, but went on 5x as long. It was crude, but for some reason, not that offensive. I dunno, it was all over the place like this "mini review". Daylight Savings Note: I dreamt (is this not a word?) that I was trying to find a place to sleep (away from the bad guys). I woke up feeling like I didn't find it. The work day was especially lengthy. I was feeling indecisive again, but really missed knitting. I did a few rows of my monster blanket, but really I wasn't feeling it. 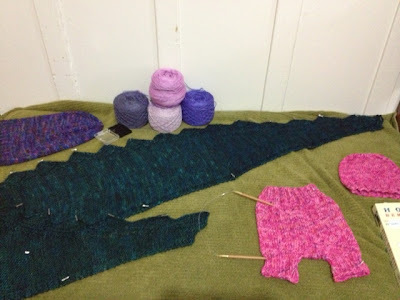 So I began to look for the frogged yarn that was once Granlibakken. I could not find it. I have looked in all the usual places, including the office. I have also looked in some unusual places ... nothing. Now, I was not sure if I wanted to knit this right away, but because I cannot find it, I really want to knit it. Now, I have yarn. I probably have another set of US6 needles I have the pattern already printed out. But I want to know where that bag is. I think I've fretted a total of 3 days. I know 1 hank, it's a purchasing problem I have.Good for a combination but alone? Hat? Handwarmers? 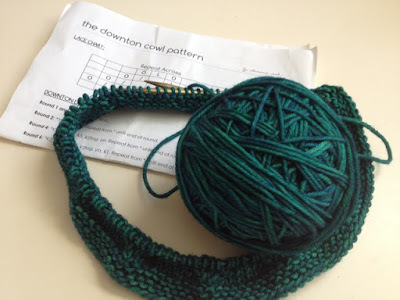 I decided to do The Downton Cowl again. As you can see I haven't gotten very far. The sad part is, I was knitting the tired knit and should've put it down a few rows back, but kept going ... I kept going incorrectly and now, have to back it out a couple hundred stitches to see where I went wrong. That's just how I knit. It's not pretty, it's not fast, but it's pretty amazing that I still love it so much. 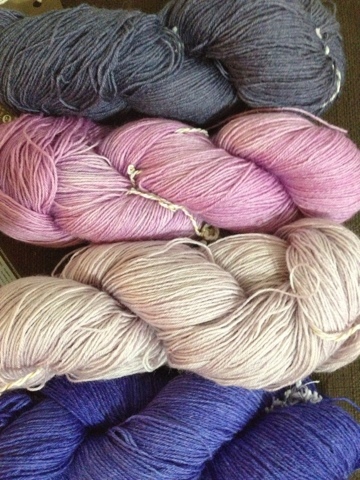 Madelinetosh is so dreamy. I'd like to finish this by the end of the week. Just because. unlike that bad mean sock yarn that is hiding from me. ugh! A documentary, questionable parenting, and a Disney movie. Yesterday when the baby shower was done, new soccer boots/cleats were bought, a friend had been driven to the airport, and it was very clear the entire household had given up on weekend chores we decided to watch a movie. I think I've mentioned before we all do things when the t.v. is on. Knit, read, lego. We aren't always very conventional? with our parenting. I don't think we do it on purpose, but you know, it is how we are. This is my preface for explaining we watched Bully with our 4th grade 10 year old. His father and I had been wanting to watch it, and we felt that he could watch it too, especially after the anti-bullying campaigns at school. We've had it for weeks, but have been putting it off. I think, much like some of those books on my night stand, I am aware of how hard I might take these stories. Bully is a documentary, so this is not a fiction but a truth for many families. I am not going to lie to you. It was heart breaking and it was frustrating. There was hope, and change, but it was just heart breaking for me. It was at times uncomfortable for my son, as suicide was discussed ... of a child just a year older than himself. Freshly grieving parents (I can't imagine when it doesn't feel fresh for them) my husband could not handle. Our family is fortunate, we are part of a community in a great school, with families that have become friends. However we live in an urban community, and we live, work and learn amongst a larger community than what we can hand pick who we interact with. There will be a lot of different types of dynamics between these people, that we witness and live through. I think identifying such a horrible one that mars many childhoods is not a bad thing. I think the movie as sad as it was for me, helped us talk to our son about bullying beyond, "don't." Immediately after our conversation and sealing up the Netflix envelope I switched cable t.v. on, prowling for something light-hearted. I found "Tangled", the Rapunzel story. The Kid and I were riveted, even with the singing and my husband sat down and we laughed at the Disney hijinks and adventure ensuing. It was already late. We were pushing close past his bedtime and he was already brushed up with his face washed. And then I did it. I said he could stay up and watch the end of the movie with me. The latest he's ever stayed up on a school night but it was a good snuggle and a huge contrast to the education we just had just watched before. Some say I could've waited until 5th grade when he is closer to prepping for middle school. Some say the conversation is enough. I'm okay with it. But maybe I'll save a copy of Lord of the Flies for his 11th birthday. What do you think? Did I push it too far this time? I wonder what my mother would say.